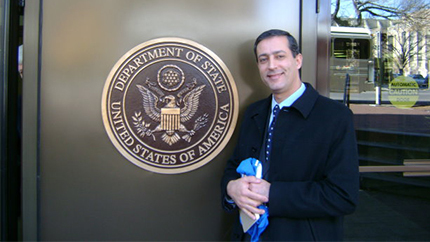 On March 21, 2014, Lebanese Fulbright alumnus Dr. Ziad Fahed was honored by Temple University for his work as an “Outstanding Leader in Interreligious Dialogue.” Dr. Fahed currently serves as the Dean of Students and an Associate Professor at Notre Dame University-Louaize in Beirut, Lebanon. As a Fulbright Scholar, he worked with Temple University's Dialogue Institute on the 2008 Fulbright Interfaith Community Action Program to bring together ten religious leaders, scholars, and community leaders from Saudi Arabia, India, Israel, Indonesia, Pakistan, France, Malaysia, Lebanon, England, and Burkina Faso. Upon returning to Lebanon, Dr. Fahed founded the Dialogue for Life and Reconciliation Organization, an NGO that facilitates interaction and communication among Lebanese religious groups. He has continued his work with Temple University, playing a vital role in the Dialogue Institute’s work on religious pluralism in the United States. In 2010, he was elected to the Board of the Lebanese State Alumni Community, which promotes cultural, educational, professional, and academic relations between Lebanon and the United States. Finally, Dr. Fahed led a team for the 2011 Alumni Engagement Innovation Fund (AEIF), and won a grant for his project, entitled “Remembering Lebanon’s Marginalized Communities.” The 10-day workshop brought together 30 Lebanese university students from around the country to engage in dialogue to promote a greater understanding of religious differences and shared values.